Christians often live far below their potential. What we express with our mouths often does not match what we express with our lives: it’s the profession-expression gap. While our behavior does not save us, it does have kingdom impact. Few things hinder Christ’s interests in the lives of unbelievers more effectively than the poor testimony of His own. It is not a matter of living some sort of idealistic, perfect, or fault-free existence in order to qualify as a bona fide Christian witness. Romans 8:19 says the creation awaits the manifestation of “sons.” That is relational in essence. What the world longs to see is authenticity in relationships: with God, each other, and the world. Perplexed leaders throughout history have attempted to address this profession-expression gap by preaching and teaching various forms of “discipleship” and “accountability.” However, the result is frequently counterproductive and often disastrous. One of the deficient methods used historically[i] to attempt to close this gap, which is experiencing modified and expanded resurgence in the emergent apostolic movement, is the doctrine of “spiritual covering.” Those of us over forty are old enough to remember the discipleship movement of the seventies. It was the poster child of good intentions gone bad. To their great and eternal credit, many of the primary leaders of the movement later repented for their error and the excesses of the movement. There are many degrees and variations on this teaching. At its most benign level, having a spiritual covering is used in a non-technical sense of relating to someone who looks out for, or cares for me. Certainly, the lack of genuine care for one another, is epidemic in the Church. Many people are in it for themselves. Finding an authentic Christian who genuinely cares for your welfare is a wonderful thing. Caring for one another and looking out for one another is as elemental to Christianity as chicken to the Colonel. The problem is twofold: 1) covering is not the term the Bible uses for mutual care (the misuse of terminology can get us in trouble), and 2) though benign in intent, it easily becomes malignant in expression. The doctrine espouses that everyone needs a spiritual covering—someone to whom they are “accountable.” Allegedly, the divine order is: husbands cover wives, pastors cover their church, so-called apostles cover pastors (and other ministries submitted to them), and so on up the hierarchy. 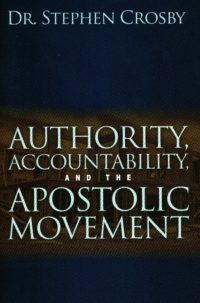 Within the ranks of the so-called New Apostolic Reformation, Dr. C. Peter Wagner honestly points out that the matter of so-called “apostle-to-apostle accountability” is not totally resolved. [ii] That is a kind way of putting it. The whole construct is a control-authority pyramid scheme scam (not to mention the damnable doctrine of “tithing up’: that a pastors tithe is allegedly due his/her “covering” apostle/superior, that the “tithe” flows up the hierarchy from level to level. Authority can be an intoxicating brew. It is far easier to exercise it than yield to it or yield it to another. This is another reason why it is a mistake to define apostles and the apostolic movement primarily in terms of authority, rather than from a center of Calvary-consciousness and love. Great authority or “visionary leadership” do not distinguish apostles but rather their patience, power, love, and suffering. [iii] We will talk more about this in the next chapter. The doctrine of spiritual covering needs to be rejected for the superstitious spiritual paranoia that it is. The power of the life of Christ is in participation with Him in His death and resurrection,[vii] not in the spiritual covering of an apostle or some other ministry official of rank. Whether or not we have relationship with others who can speak to and care for us is not the issue. We should. It is the implication of the idea that a person, any person, can take the place of Christ as the broker of spiritual blessing and safety. When maintenance of “governmental alignment” or “staying under covering” are contingent for the believer to allegedly receive divine blessing or to avoid divine judgment,[viii] we have embraced an anti-Christ spirit, regardless of how well intended our motives may be. Copyright 2016, Dr. Stephen R. Crosby, www.stevecrosby.org. Permission is granted to copy, forward, or distribute this article for non-commercial use only, as long as this copyright byline, in totality, is maintained in all duplications, copies, and link references. For reprint permission for any commercial use, in any form of media, please contact stephrcrosby@gmail.com. [i] It was a major characteristic of the Discipleship Movement of the 1970s. [ii] Wagner, Churchquake, p. 98. [iii] 2 Corinthians 6, 4, 12:12, 15. [iv] Terminology we can overlook but should likely change. I recommend not using it because of its contaminated implications. [viii] See Bevere, Under Cover, throughout the text. Too much of the time so-called “spiritual covering” is tantamount to spiritual abuse. Yup . . . more common than not. Yes! Stop the nonsense! Frank Viola wrote about this as well. I wished I had known about his Who Is Your Covering? so I could have given a copy to all the leaders at Generational Ministries Fellowship and every individual at Lifestream Christian Fellowship (CityChurch) in Puyallup. I recently re-read the book “Listen To Me, Satan” by Carlos Annacondia, and realized that it uses the term “Spiritual covering” in a way that has nothing to do with one believer over another. It’s simply talking about God’s protection. It’s nice to see the term actually used in a healthy way for once! But it’s true that when most people hear the term “spiritual covering”, they think of a person who is supposedly “God’s appointed authority” over you. That is the point. God is big enough to handle the job of looking out for His own. The problem with the term “covering” is it sets up certain mental and psychological constructs that are without any biblical legitimacy. For example, how often do people talk and sing about being “covered by the blood of Jesus?” All the time. It is a completely unbiblical concept. You cannot find a single verse in the NT that speaks of the blood of Jesus “covering” sin or “covering us.” Yet if you should ask a typical believer they would not even think to question if it is a biblical concept or not, the term is so deeply ingrained in our psyches and too often in our psalms, hymns, and choruses. I handle this matter in detail in the book. Well said and crystal clear. I think you are onto something, brother!